The Music Box - ZineWiki - the history and culture of zines, independent media and the small press. 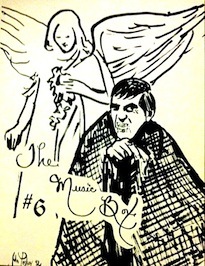 The Music Box was a fanzine published by the Oregon Dark Shadows Society. Devoted to the television serial Dark Shadows, this fanzine was released in the 1990s in Portland, Oregon, U.S.A. It was edited by Connie Jonas and published by Harmony Road Press. The Music Box was named for the gift that Barnabas gives to his fiancé Josette before her death on the eve of their wedding. At least 6 issues appeared. The first issue appeared in 1991. Issues 2 and 3 were combined in one issue, also released in 1991. Issues 4 and 6 were released in 1992. The Music Box featured art, fiction, poetry and fan news. Contributing artists included John Peskey, and Kelthammer, among others. Harmony Road Press also released several fiction novels devoted to Dark Shadows characters, such as A Matter of Trust, Masks and Facades, and the anthology Shadowed Reflections. It also released the anthologies Christmas in Collinsport, The Collinsport Players Companion, and a fanzine devoted to actress Lara Parker, who played the witch Angelique on Dark Shadows, called The Lara Zine. This page was last modified on 14 March 2015, at 14:26.